I have been making Pillsbury Crescent rolls for a long time. And I recently learned that that along with the original Pillsbury Crescent Rolls they also have a new Pillsbury Crescent Recipe Creations refrigerated seamless dough sheet. I was sent 2 coupons for Pillsbury Crescent rolls and 3 serving platters. To serve my appetizers on. I can't wait to make one of the above appetizers. 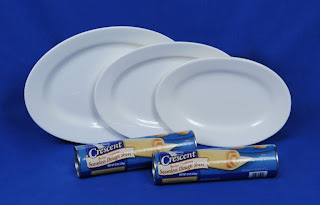 Win It: One lucky reader will win 2 VIP Coupons for Pillsbury Crescent rolls (valid only in the US) and the 3 serving platters as pictured above. Mandatory entry: Visit the links provided above for the 3 different appetizers. Then come back here and tell me which appetizer you think I should make. 5. For 5 extra entries blog about this giveaway, linking back to this post. RULES: Giveaway is open to US Residents only. Giveaway ends December 27, 2009 at 11:59 PM. Winner will be chosen via Random.org. Must have valid email in blog profile or leave email in comments otherwise you will be disqualified. Winner will have 48 hrs. to confirm by email, If no confirmation in that time frame a new winner will be chosen. Disclaimer: Pillsbury provided me with the free product, information, and gift packs through MyBlogSpark. Well, I think you should go with the tartlets and let me know how they come out, because I want to try them. I went over there and found a recipe for peppermint candy cane cookies I am going to try tomorrow. I already follow you on twitter, but I did RT ya! I would pick the Crescent Bacon-Cheese Tartlets! Thanks! My vote goes to the Crescent Tree - how cute is that for the holidays! Go with the Holiday Tree - it's festive and fun! I've made the Tartlets & they are super yummy - so those are my vote! I am a blog follower through google friend. follower on twitter & I tweeted! I think that you should go with the Crescent Bacon-Cheese Tartlets. You can never have too much cheese OR too much bacon! yummm! i follow you ( @jerricapuck ) & retweeted your tweet. Crescent Bacon-Cheese Tartlets--they all look delicious. The tartlets gives the easy opportunity to try out differnt fillings. Adding Red or Green pepper strips would give you holiday colors to create patterns when you arrange the platter. I think you should do the tartlettes. You can vary the filling with spinach & artichoke or a broccoli and cheddar or go fancy with crab or shrimp filling! Yum! I now follow you too! Good luck! I would make the Tartlets they look so yum. I am thinking the tartlets! They are always a hit in my house!!! I'd say the Crescent Bacon Cheese Tartlets. I think I might give them a try myself! The tartlets get my vote because they are portioned out and easy to eat for the guests. The Crescent Wrapped Brie, of course!! YUM. I'm definitely going to make those tartlets. ANything with bacon, cheese and ONIONNNNNNNNNNNN rocks! I think you should Crescent Bacon-Cheese Tartlets. I read bacon and I said that is perfect, YUM! We r friends on twitter!! I like the cresent holiday tree. I think you should make Crescent Bacon-Cheese Tartlets. I oick the Crescent Wrapped Brie. I am getting hungry just looking at the phot. Thanks for the giveaway! I am a follower on Google Frineds. You should make the crescent bacon cheese tartlets! I think I'm going to try those out! Oh my...hands down. The brie! Love that. And it's soooo easy! I vote the Crescent Bacon-Cheese Tartlets. 'Coz I mean, let's be honest .. everything is better with bacon!! Am now a Stay At Home follower. Am now following you on twitter (as tauntsociety). Thanks! Try the Tartletts. Sound so yum. I would go with the Bacon-Cheese Tartlets. You can't go with cheese or bacon. I think the Crescent Bacon-Cheese Tartlets would be great for you to make. They seem perfect for the holidays. cuz i love cheese and i love bacon . invite me over! I think you should make the Crescent Bacon-Cheese Tartlets. You could always change it up by using bleu cheese or ham instead. I think you should make the tartlets. 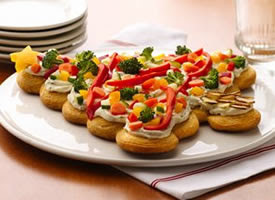 I make an appetizer similar to these, and they are always a huge hit. I think you should make the Crescent Holiday Tree. To make it more yours, mix some chopped chives in with the cream cheese. Try "decorating" it all in one color. I LOVE Crescent rolls!!! The bacon cheese tartlets would be my pick - YUMMY!!! New twitter follower - savinginstyle - yay!! I think you should make the Crescent Bacon-Cheese Tartlets, but they all look really yummy. I would like to try the Crescent Holiday Trees. I would make the Crescent Bacon-Cheese Tartlets. Decisions! Decisions! Crescent Bacon-Cheese and those holiday trees...how cute are they? 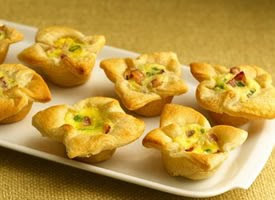 I'd say the Crescent Bacon Cheese Tartlets, they look very yummy & easy to make. I would definitely make the Crescent Holiday Trees but I wold add some crab meat or spicey sausage. Crescent Bacon-Cheese Tartlets looks great! I like the tree but the tarlets seem easier. I would pick the Crescent Wrapped Brie...yummm. I wish I'd known about the seamless dough. I could have used it at Halloween!! Oh that tree looks so yummy I want to make it!! The Crescent Wrapped Brie looks best to me! I vote that you give that one a try! I think I would make the first one. The Cresent Wrapped Brie just sounds so good! The tartlets look so pretty! I would pick those. I would pick the Crescent Bacon-Cheese Tartlet.They look yummy! I followed you on twitter and retweeted. Tartlets would be the way to go. You can change the fillings to make it your own. i would go with the cresent holiday tree. cream cheese and yummy veggies how could you go wrong. I think the Bacon and Cheese tartlets. They all take generally about the same length of time but I think that the tartlets would be something that would be appealing to most people. I know that my husband would be all ove them because bacon and cheese are his favorites. Crescent Tree looks the tastest and is perfect for the holidays! The tree looks like it would offer up the most versatility as far as customization. It would be my pick if I were going to try and get featured on pillsbury.com. 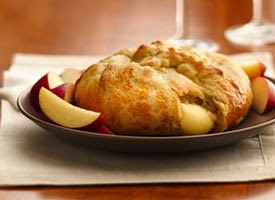 That stuffed brie looks delicious though......mmmmmmmmm cheesy goodness. The tartlets 'cause everything's better with bacon, right? I think I may have hit publish comment without actually commenting. Important: don't do that. You should try the Bacon-Cheese tarlet. They sound wonderful and easy! I think the tartlets look the best and seem like the easiest to prepare. Plus, they are single-serving (as opposed to the brie which is communal and the tree whose beauty would be "destroyed" after the first hungry person partook). I'm actually going to try the tartlet recipe, myself. They look yummy! I think you should make the Crescent Bacon-Cheese Tartlets. If I was at a party...I know I'd love to try one. I think you should definitely make the Crescent Holiday Tree!